Frequently Asked Questions Q. Do I get 2 BoardMates? A. Yes, they are sold as a pair (2 units per set) Q. 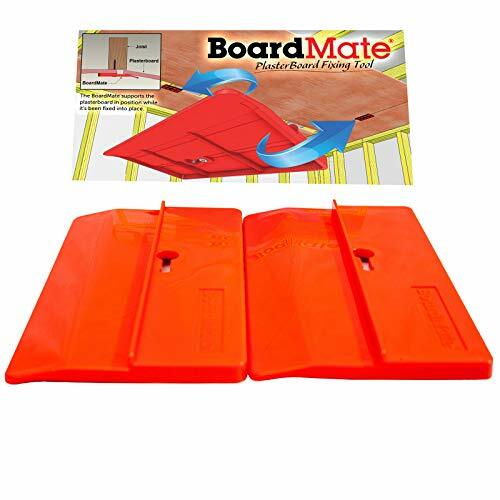 What thickness of board is BoardMate suitable for? A. Any. Q. What is the working life of BoardMate? A. Boardmate is made of non-wearing ABS Plastic, designed to last forever. BoardMates Are sold as a set of 2. Manufactured of Pro Grade ABS Plastic. Designed to last forever. Come with a lifetime warranty. A Full Money Back Guarantee if dissatisfied for any reason. Our heavy-duty drywall lift can help you get your job done faster and easier, perfect for commercial or home use. It's sure to do all the heavy and hard work for you.The drywall lift allows one person to lift a drywall panel that is up to 4*15.9 ft in size, without assistance.The panel can be raised to a maximum height of 11ft for attachment to level ceilings or (with the lift's cradle tilted) to sloped ceilings or side walls.For higher ceilings,an Extension Accessory is available that increases maximum lift to 15.4ft.The lift's cradle lowers to 34in.off the floor for easy panel loading,and can support up to 150lbs. 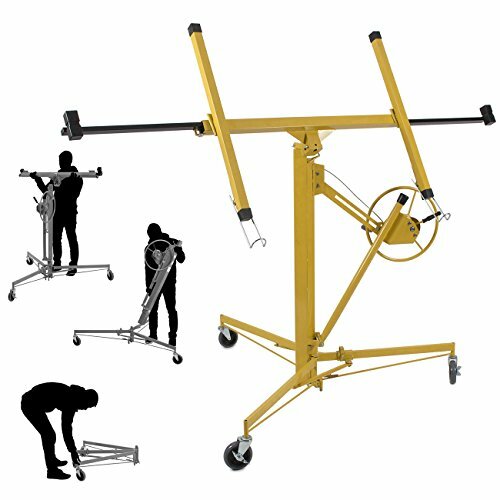 It has 3 large casters that allow moving it over uneren floors.Hoist with tilting action allows 1 person to handle and apply drywall panels. Easy to assemble and disassemble,no tools required. Our Troy drywall lift is made from an all welded steel construction, tool-free assembly and teardown, single stage winch with brake, and can be used by one person. It has a 11-foot maximum reach for horizontal ceilings and a 15-foot maximum reach for walls (determined by the 11-foot max lift and half the length of drywall). It can hold a 4-by-16-foot single sheet capacity, with a 150 lbs load rating, has 5-inch casters, and weighs 110lbs. MaxTool also backs up this lift with a Two Year Warranty for parts or factory defects. Troy DPH11 Heavy Duty 11-Foot Drywall Lift Single-stage winch with handle and braking mechanism for easy and secure lifting. Click to View Turn a Two Man Job into One Drywall sheets can weigh up to 105 pounds making installation a two man (or even three man) job. With a Troy drywall lift, you can install full sheets of drywall in a fraction of the time and you can do it all on your own. The Troy drywall lift is easy to setup, simple to operate, and is built from commercial grade steel. It is rugged enough to be used on a professional job site and easy enough for a do-it-yourself job in your own home. Backstop with Rubberized Feet: Prevents any movement of the drywall lift while drywall is loaded and in position for hanging on a wall. Once your lift is in place, simply flip the backstop down and your lift and sheet of drywall are secure. Support hooks secure the drywall on the lift and prevents it from sliding off during placement. Click to View Support Hooks: Secures the drywall on the lift and prevents it from sliding off during placement. Also helps pivot the drywall sheet into place so it is flush against the wall and adds support to prevent the edges of drywall sheets from getting crushed and broken. 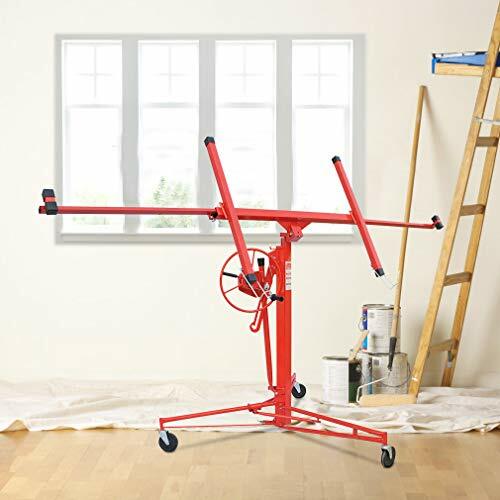 Telescoping Arms: Extend and allow you to hoist even monster 16-foot sheets of drywall. Sheets this size can weigh up to 105 pounds and would require a few people to install without a drywall lift. This heavy-duty drywall dolly by GypTool is built for professionals. Constructed from high-capacity steel, it has a genuine-rated working load of just about 1,800 pounds; this will compare to carts with "maximum loads" of near 3,000 pounds. It also has a large 12"-deep deck that is open for quick loading, angled so sheets won't tip, and beveled on the edges so your material won't be scuffed. This cart is built with an intelligent design; it has a rounded safety bar that surrounds the perimeter and will help protect your legs and prevent damage to walls and boards; the handle in the same tubing is easy on the hands. Pro-grade, non-marking 8" casters support this dolly and roll smoothly under heavy loads. It has a tight-turning radius with 4 swivel casters and won't rock or wobble when loaded; it is super sturdy. Only minor assembly is required; this cart is easy to put together and break down for storage - just remove the handle. Capacity: 24 x 1/2" sheets. Construction: Steel. Color: Orange. Deck size: 45" x 12". Overall dimensions: 50" (Long) x 23" (Wide) x 48" (Handle Height) x 13-1/2" (Deck Height-Highest Point). Includes: Professional dolly, 4 x 8" swivel casters (One swivel caster has a locking pin feature which temporarily stops that caster from swiveling), tools for assembly, and instructions. Tool free assembly--Easy assemble, no tool required. Quick tool-free setup and disassembly for storage. Built-in winch with brake--The lock device and built-in winch brake to guarantee safety and sturdiness while working. CE standard --CE standard lift, build with All welded steel construction. Features 3x4 caster wheels for easy rolling and stop. Drywall sheets can weigh up to 150 lbs. making installation a two man (or even three man) job. With a Arksen drywall lift, you can install full sheets of drywall in a fraction of the time and you can do it with no help. Carry up to 150 lbs. Diversified Tools Pocket Kicker - Drywall Panel Lifter + Edge Rasp + Scraper - Door Hanging Tool - Versatile Drywall Installation Tool. The Diversified Tools 812-DT Pocket Kicker lifter with the Exclusive Gypsum Jaws Rasp is a patented 3-in-1 universal lifting, rasping and prying tool. This small lightweight tool lifts wallboard, doors, paneling, tiles, pries loose baseboards, trims and rasps wallboard edges. The Gypsum Jaws Rasp never dulls and will not cut you. Fits in tool pouch or pocket. Lifts wallboard, doors, paneling, plywood, appliances, tires, etc., pries loose baseboard and trim and rasps drywall edges. Fits in tool pouch or pocket. Made from heat-treated aluminum. 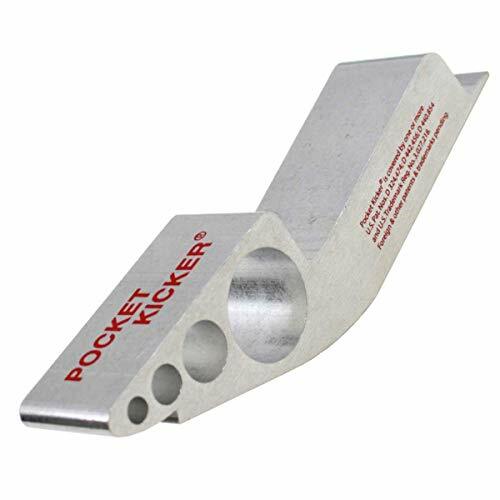 Diversified Tools Pocket Kicker is a versatile drywall tool - foot lifter, kicker, rasp, and pry tool. Lifts wallboard, doors, drywall, paneling, and tiles into position with ease. Easily accessible - Fits in your pocket or tool belt, replaces heavy lifters and large costly rasps. Gypsum Jaws drywall edge rasp never dulls and will not cut you. Ergonomically designed and made from durable, heat-treated aluminum. The Lift is a must-have tool for anyone who needs to lift drywall, plywood, sheet metal, stone slabs, etc. Our innovative design allows a single person to lift full sheets of materials with only one hand. The tool consists of a gripper clamp and a handle. The handle is connected to a joint in the clamp, making the clamp self-adjusting. To use, place the clamp portion of the tool over the top edge of the material you need to lift. Then simply lift! As you lift, the clamp automatically adjusts to the thickness of the sheet or panel, gripping it tightly. 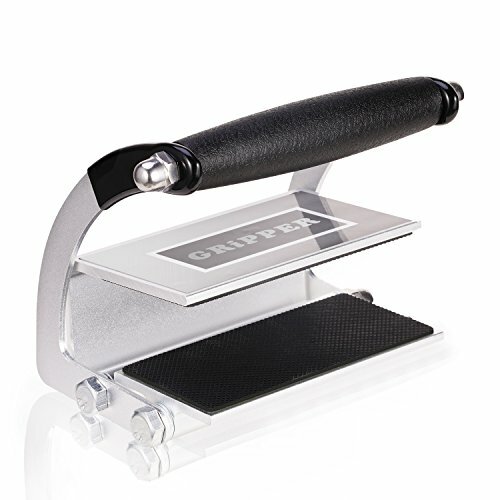 The clamp has a rubber grip surface that applies even pressure to the sheet or panel. When you're ready to remove the Lift, simply set the material down and the clamp will automatically release its hold. Our versatile, yet simple design allows the Lift to hold onto a variety of materials. Use it to carry MDO panels, MDF panels, OSB, and other kinds of plywood, as well as melamine, drywall/sheetrock, tabletops, stone slabs, sheet metal, and other sheet goods. The gripper accommodates material thicknesses of 0 to 1 inch, and it can securely hold onto loads of up to 200 pounds. You can use it to safely lift up to two panels or sheets at a time. This tool is exceptionally well built. 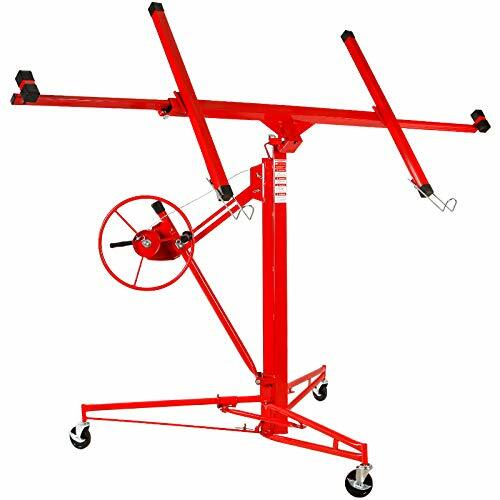 It has a solid metal construction: the clamp and the handle arm are machined from aerospace-grade aluminum, and the joint is made from a solid steel bar. The handle itself is made of durable, impact-resistant ABS polymer. The Lift is so ridiculously well made that we offer an unlimited warranty-simply send us the damaged Lift and we'll send you a replacement. This tool makes lifting panels and sheets significantly easier, and it makes lifting easier on your back as well. Rather than bending over to lift panels and sheets from the bottom, you can use the Lift to hold panels and sheets from the top. Compared to competitors' prices, the Lift represents the best value on the market! 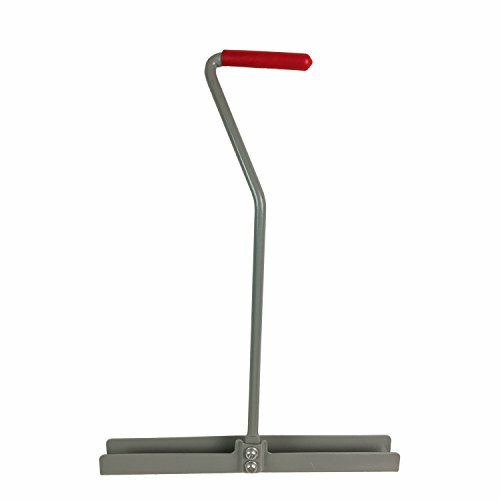 HEAVY-DUTY HOLDER FOR CARRYING DRYWALL, PLYWOOD, ETC. 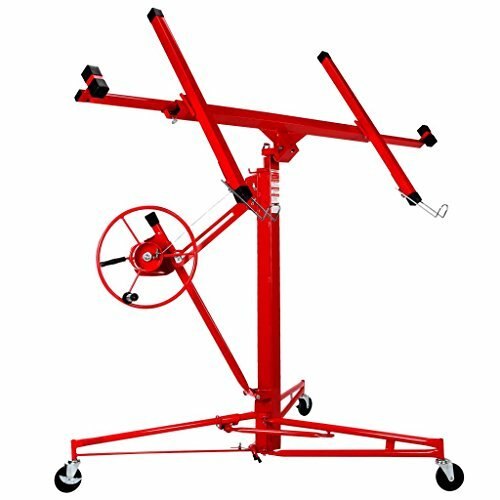 - Gator Lift presents one of the most innovative tools for lifting and carrying all kinds of plywood, panels, sheets, and slabs. Use the Gator Lift to grip and carry MDO or MDF panels, OSB, melamine, drywall, tabletops, sheet metal, and other sheet goods. The self-adjusting gripper accommodates panel thicknesses of 0 to 1 inch. GRIP HANDLE FOR ONE-HAND CARRYING - This panel/plywood lifter features a durable, impact-resistant ABS handle that makes it easy for a single person to lift and carry full sheets of material with only one hand. The clamp can hold up to two sheets or panels at once, accommodating loads of up to 200 pounds. Get the job done quicker with this convenient sheet and panel mover. SOLID METAL CONSTRUCTION - This tool is built to last, with a heavy-duty solid metal construction. The clamp and the handle arm are machined from aerospace-grade aluminum, while the joint is made from a solid steel bar. The handle itself is made of durable, impact-resistant ABS polymer. This high-quality construction ensures that the tool can hold up to a lifetime of strenuous use. EASY ON YOUR BACK - Carrying drywall, plywood, and sheet goods can be very hard on your back. This handy tool takes the strain off your back and allows you to carry heavy materials with a single hand. Rather than bending over to lift materials from the bottom, simply place the clamp over the top edge of the material, then lift. The self-adjusting clamp holds materials tight as you lift. 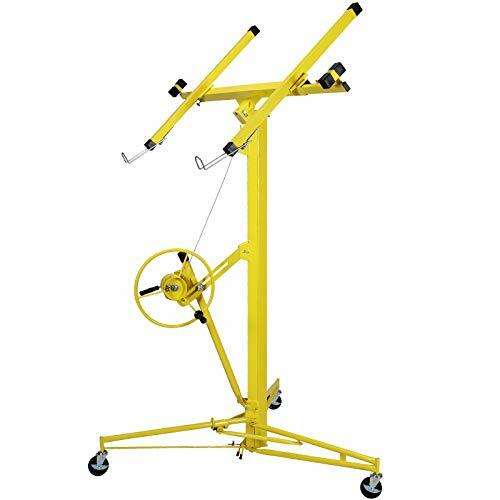 SELF-ADJUSTING GRIPPER CLAMP - This piece of equipment by Gator Lift has a versatile, yet simple design that allows the clamp to grip onto a variety of different kinds of panels and sheet goods. As soon as you start lifting, the clamp automatically adjusts to the thickness of the panel or sheet. This innovative tool can hold up to two panels or sheets simultaneously. 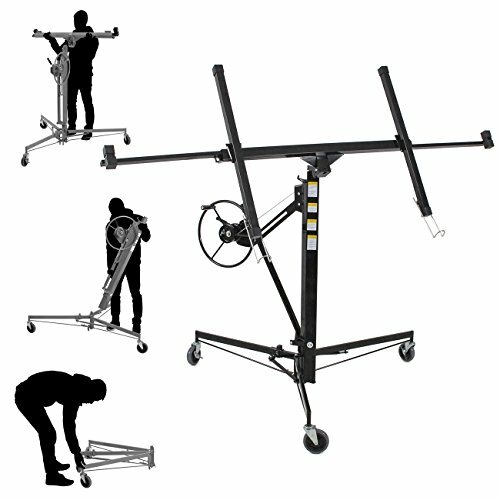 This heavy-duty drywall dolly by GypTool is built for professionals. 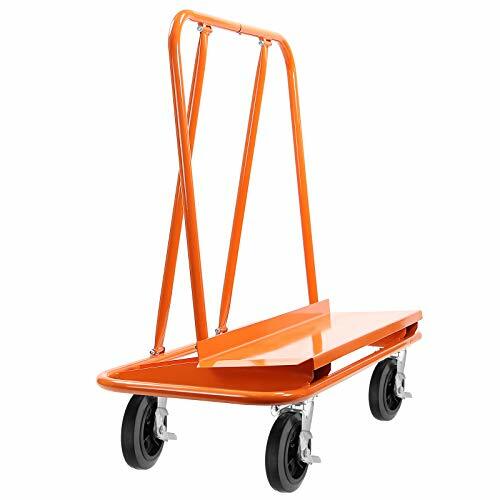 Constructed from high-capacity steel, it has a genuine-rated working load of just about 1,800 pounds; this will compare to carts with "maximum loads" of near 3,000 pounds. It also has a large 12"-deep deck that is open for quick loading, angled so sheets won't tip, and beveled on the edges so your material won't be scuffed. This cart is built with an intelligent design; it has a rounded safety bar that surrounds the perimeter and will help protect your legs and prevent damage to walls and boards; the handle in the same tubing is easy on the hands. Pro-grade, non-marking 8" casters support this dolly and roll smoothly under heavy loads. It has a tight-turning radius with two swivel casters and won't rock or wobble when loaded; it is super sturdy. Only minor assembly is required; this cart is easy to put together and break down for storage - just remove the handle. Capacity: 24 x 1/2" sheets. Construction: Steel. Color: Orange. Deck size: 45" x 12". Overall dimensions: 50" (Long) x 23" (Wide) x 48" (Handle Height) x 13-1/2" (Deck Height-Highest Point). Includes: Professional dolly, 2 x 8" fixed casters, 2 x 8" swivel casters (One swivel caster has a locking pin feature which temporarily stops that caster from swiveling), tools for assembly, and instructions. This is our drywall lift which will make work easier to install 4' x 16' sheets. With its sturdy welded steel construction, this drywall lift will create greater balance, better control, more stability and less fatigue and it is perfect for both commercial and home use. 5" Caster Wheels 3pcs of 5'' caster wheels for easy rolling from room to room and keep balance. 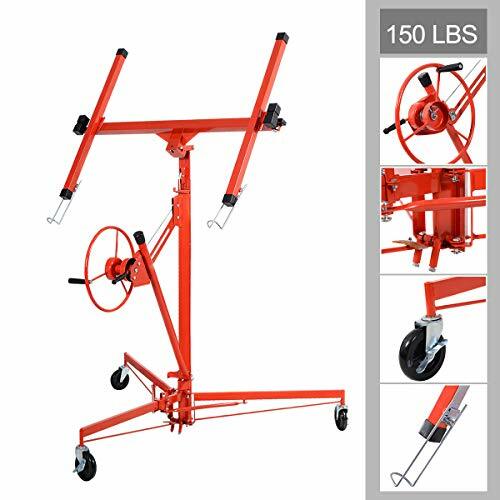 150Lbs Load Capacity This drywall lifter is made of heavy duty steel which ensures its long life span. Its load capacity is about 150 lbs. Built-In Winch with Brake Lifter is easy to assemble and disassemble. The lock device and built-in winch brake are included, which guaranteed its safety and sturdiness. Hoist Up on Walls or Ceilings Ideal for installing 4' x 16' sheets, can be hoisted up on walls or ceilings, time saving and labor saving. Both Home and Commercial Use Perfect for both home & commercial use. 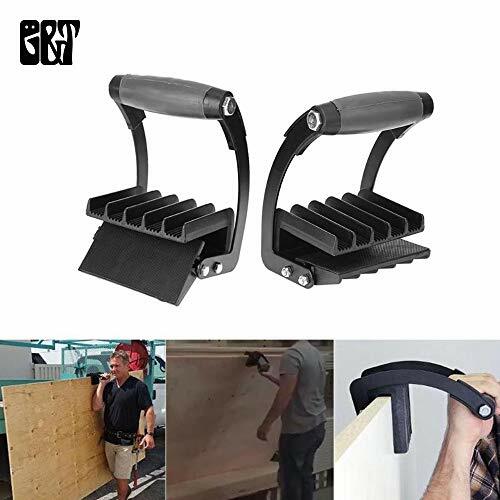 G&T Panel Carrier Gripper This Panel Carrier Gripper is a perfect tool for carrying some furniture, like table, cabinet and even some board when your hand is not wide enough to hold the side of the staff. With this gripper, you can hold the flat staff easily and even carry it all by yourself. specifications Product material: nylon + iron Color: Black Product size: 185*125*130mm/7.28*4.92*5.12inches Max open width: 130mm packing list 1 x Panel Carrier. Solve the problem of big template difficult to handle. Automatic clamping, sturdy and durable; labor saving. The max rated load is 100 pounds (45 kilograms). Ergonomic design for one person, Cushion-handle for all day comfort. High-strength glass-filled nylon polymer gripper plates. Drywall sheets can weigh up to 150 lbs. making installation a two man (or even three man) job. With a drywall lift, you can install full sheets of drywall in a fraction of the time and you can do it with no help. Tool free assembly--Easy assemble, no tool required. Quick tool-free setup and dis-assembly for storage. Unihome 16 FT Drywall Lift get your drywall projects done more efficiently, and save your time, money and frustration. Easy to assemble, the Panel Hoist can be used in relatively no time.The lift makes installing a Sheetrock ceiling quick and easy. The crank wheel and main support is heavy. The cable and brake system keep balance when you work. Hoist Up on Walls/Ceilings--Lifts 16' Ceiling & 19' Wall,Apply various Drywall panels up to 4ftx16ft. With a Unihome drywall lift, you can finish installing sheets of drywall in your basement, garage, warehouse and workshop on your own. Hoist Up on Walls/Ceilings--Lifts 16' Ceiling & 19' Wall,Apply various Drywall panels up to 4ftx16f. Make your drywall projects quick and easy, save your time, money and frustration. The crank wheel and main support is very heavy. Max load Capacity 150 lbs. The lock device and built-in winch brake get more safe and efficient. 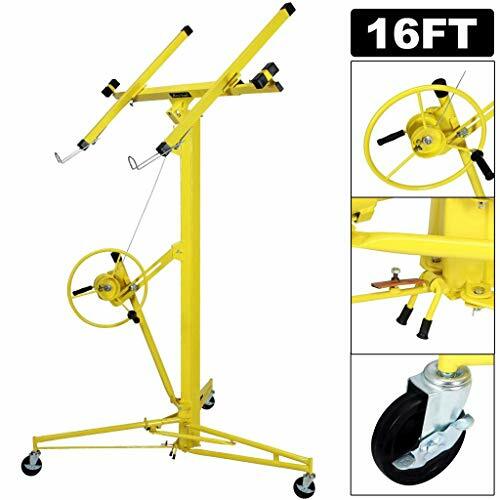 Max Height: 16' Adjustable height: 6'to 16' Apply various Drywall panels up to 4ft*16ft 4 caster wheels for easy rolling. Unihome Drywall Lift get your drywall projects done more efficiently, and save your time, money and frustration. Easy to assemble, the Panel Hoist can be used in relatively no time.The lift makes installing a Sheetrock ceiling quick and easy. The crank wheel and main support is heavy. The cable and brake system keep balance when you work. Hoist Up on Walls/Ceilings--Lifts 11' horizontal Ceiling & Max.15'Wall,Apply various Drywall panels up to 4ftx8ft. With a Unihome drywall lift, you can finish installing sheets of drywall in your basement, garage, warehouse and workshop on your own. Hoist Up on Walls/Ceilings--Lifts 11' horizontal Ceiling & Max.15'Wall,Apply various Drywall panels up to 4ftx8. 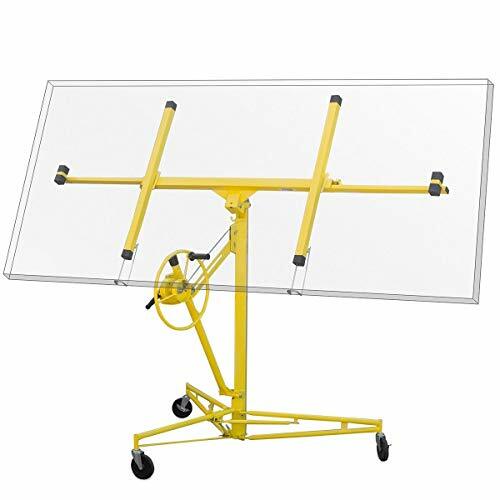 Max Height: 11' Plate size : 4'x8' Adjustable height: 4'to 11' Apply various Drywall panels up to 4ft*16ft 4 caster wheels for easy rolling.